I’ve made a start on my Lido/Wild Swimming Project. Leaving home at 5.30am!!!! in order to avoid the diabolical traffic, I drove for 2 hours to visit two pools. 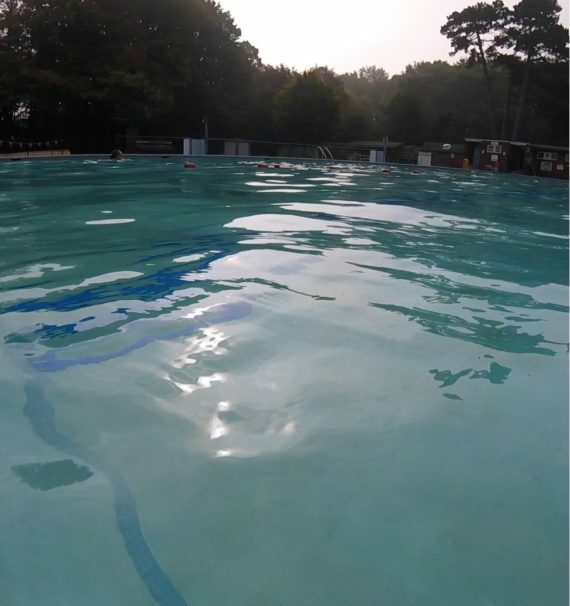 The first at Lewes, Pells Pool was 17 degrees – unheated but gorgeous pale green spring-fed silky water. The oldest open air pool in the UK. Built in 1860. Met some lovely people and vowed to return. Sadly shall have to wait till the season restarts in 2018 now. But I may try to visit a couple of all-year pools in London and then of course there’s Australia in December which will be wonderful. The second at Saltdean was a much swisher affair. The local community have clubbed together to restore the Art Deco splendour. It’s still a work in progress but HEATED bliss. Surrounded by a state of the art glass and stainless steel barrier it’s quite beautiful but somehow lacks the charm of Pells Pool. It does occupy a great site though in a hollow between the white chalk cliffs and the sea and a rather upmarket Deco-Style residential estate. As it was warmer I got a chance to play with the GoPro. I did check first that I was allowed to film. That was one advantage of going at this quiet time of year. I’m slowly getting more proficient with the GoPro. Plan to make a return visit now I’m beginning to understand what makes the best shots. Not good enough to post the videos yet but here are a few stills which, I hope, give an idea of where I’m going with this. Think I shall be making slow progress as the art class I’m teaching takes up some time. But I think it’s a line of enquiry that I shall enjoy. Have decided not to go for the Arts Council Grant as I want it to evolve and develop at my own pace without any conditions or restrictions. For instance I did think it would be all about Lidos in the UK but am sure I’ll be chasing other aspects such as Australia and maybe rivers and quarries too. The Fairy Pool on Skye also sounds inviting and mysterious. Who knows where it will lead? Well I went to the inaugural Shed meeting of UOS alumni… all a bit serious but am sure it will evolve into something more lively. Have decided not to go up on stage for an expensive handshake to collect my MA but quite like the idea of the celebratory lunch with the rest of my MA group afterwards on October 14. Have started teaching again. One of the group is 95 !!! Thought I was the oldest artist in the world but no. And actually she is the most promising member of the group in some ways as has not been life-long artist so is coming to it fresh and eager to learn without ingrained prejudices….refreshing. But as for teaching again, I have reservations. Think I’ve made a mistake in doing this. After a lifetime jumping through educational hoops both as a teacher and a student, it’s time to let go of structure, deadlines and criteria and just BE. 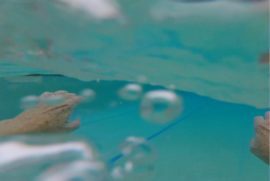 My loose idea about Lido’s and wild swimming mentioned in my last blog does not fit with the routine of teaching a class every Thursday. 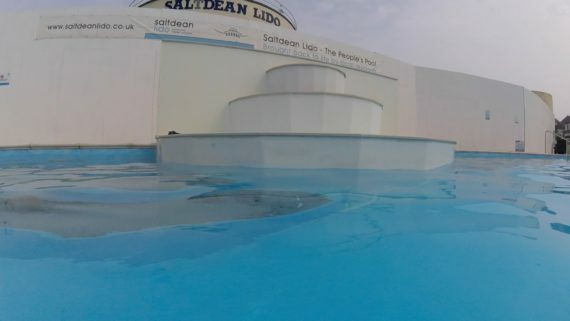 It will restrict my plan to travel the country looking at Lido’s and swimming places. The possibility of an Arts Council Grant would have a similar effect. Why do I set myself all these goals? I’m still not really letting go. Think I should just pack my paints, jump in the car and go. 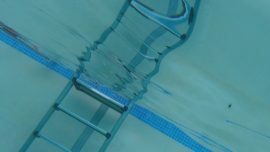 I remember when I drove to Catterline on the North-East coast of Scotland, one of the best days was when I discovered Stonehouse open-air pool and swam in a thunderstorm. The unexpected finds are always the best. I’m committed to teach until Christmas now and then we’re off to Australia for 4 weeks (that will be great!) but when I come back I will let go and drift with the flow. I shall spend the intervening time getting to grips with video and photography. Tried to find a course on iMovie technique but there doesn’t seem to be one. Everyone says ‘just play around with it’. That’s fine but so time-consuming and my limited patience doesn’t help….I’ll get there eventually! In the meantime here’s the video I made for my MA show. Swimming at Wells next the sea. This was the main exhibit at my final MA exhibition. 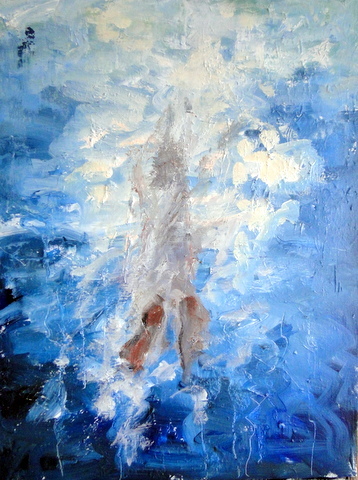 It surprised me that people seemed to like the video which inspired the paintings. Is this the way forward? I think the subject of underwater floating fabric of the dress I wore for the swim was the main attraction. After losing an underwater camera in the sea at Southwold during a swim to relieve the feelings of falling off a cliff at the end of the MA, I then had an idea of how to proceed. Happily I still had my GoPro and the swim was wonderful. 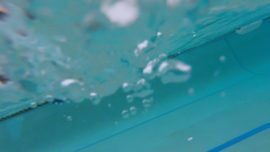 It occurred to me that it would be great to travel around the UK swimming in Lido’s and the sea and making art about the joy of wild swimming. A talk by the Arts Council Grant team was so complicated that I’ve almost decided I’d rather go it alone. Apart from the application process, it might prove quite restrictive. And I’m continually setting myself impossible goals so maybe it’s better to slow down, sit back and let things drift. Anyway, we’ll see. In the meantime I have to prepare a programme to teach an art class once a week from 10 till 3 every Thursday. Also am going back to the life-class I attend on Mondays. And then there’s The Shed – a new alumni group I’m joining for informal crits and general get-together sessions. That should be good….slowing down ??? ?